Food is a basic human need. We all need it to survive. However, at the same time, it’s one of the major expenses, too. We spend on it every day, every week, every month, every year. However, more than almost any of our household expenses, smart strategies on how we buy, store and use food makes a huge difference in our everyday expenditure. Here, we give you some insider tricks to save money and make some of you kitchen staples last longer. Keep wheat flour chilled. Yes, put your whole wheat flour in the chiller. The high oil content in wheat germ can make your flour go stale if kept in room temperature. If you’re using it frequently, store it in an airtight container inside the fridge, where it will last you up to six months. To check the freshness, sniff it. It should be completely odourless. If it smells bitter, toss it right away. Stick to buying smaller bottles of olive oil. Once the bottle is opened, this kitchen staple can go stale in three to four months (even if the bottle says it lasts longer). Fresh olive oil should smell like ripe olives with a kick of peppery aroma to it. Check it’s odour before every use—crayon-like odour indicates spoilage. If you have multiple bars on hand, freeze the unopened ones to keep it fresh for up to four months. This prevents spoilage and absorption of smell of leftovers stored in the fridge. For opened carton of butter, notice the colour once in a while. Inconsistent colour could mean that you’re not using it fast enough. Freeze it to keep it fresh until next use. Transfer your brown sugar in an airtight container, and throw in moist food items like a slice of bread, apple slices or marshmallows. The sugar granules will absorb the moisture of the food and remain soft for longer. You can also use this technique to soften hardened sugar in jars. 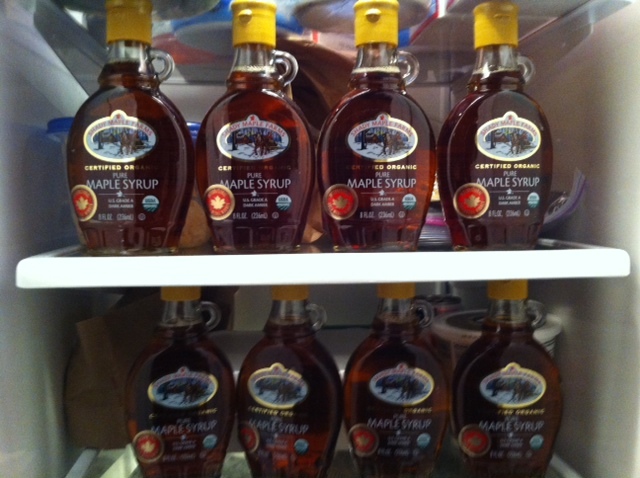 Once your bottle of maple syrup is opened, keep it inside the freezer. Don’t worry about thawing it, because of the high sugar content, it won’t freeze. Unopened pure maple syrup can last for a couple of years in the pantry. Once opened, it’s good up to a year as long as long as you keep it refrigerated. Bring your crystallized jar of honey back to life by placing it in a pan with boiling water. Stir the honey until the crystals gets completely dissolved. You don’t have to keep your jar of honey in the fridge. Even when opened, it can last forever in the pantry—thanks to bees enzymes that fight growth of bacteria in honey. Now that you know how to extend the life out of your food staples, it’s time to reorganize your kitchen. Remember that not all should be stored in the fridge, but not everything should be left out as well.